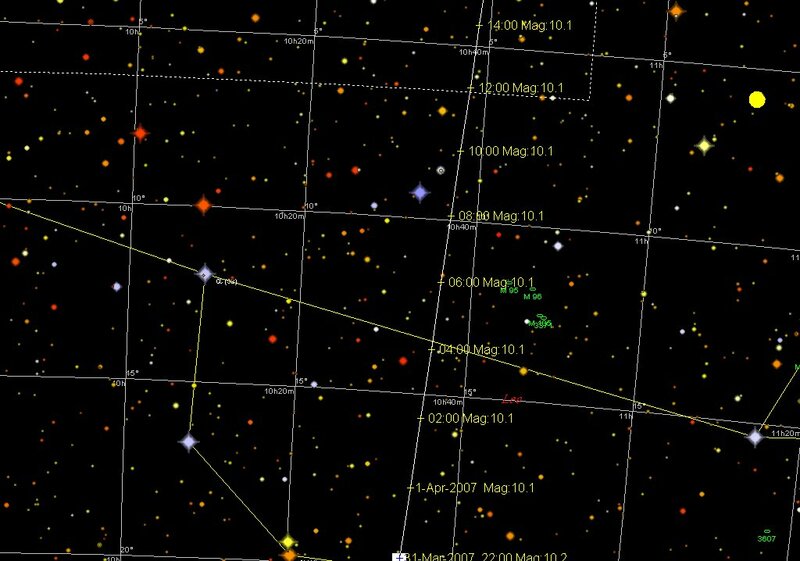 The asteroid 2006 VV2 will zoom past Earth tonight, it will be closest in the early hours of the morning of April 1 though. This will be visible in small telescopes and very high power binoculars (not 10x50's sadly). 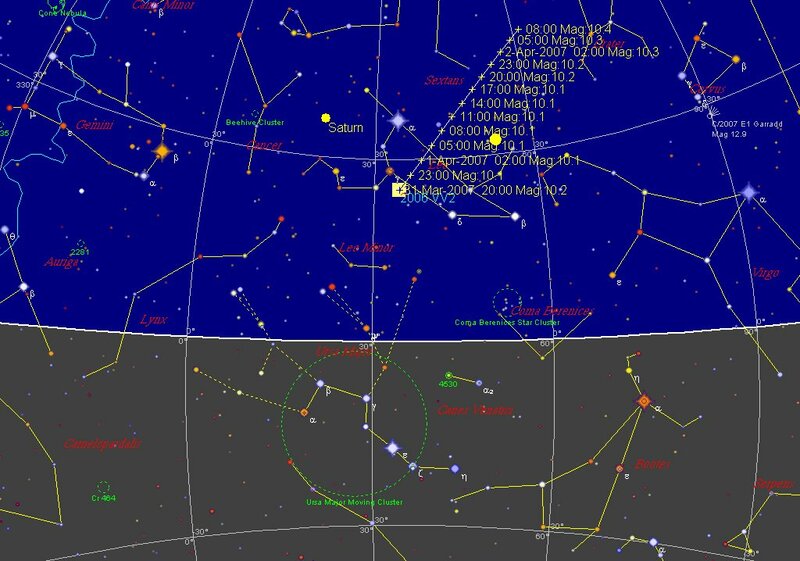 The map to the left shows the path of the asteroid (the northern horizon is shown as of 8:00 pm ACST, click to enlarge map) and the map below shows a high power view, with stars to magnitude 10 shown. 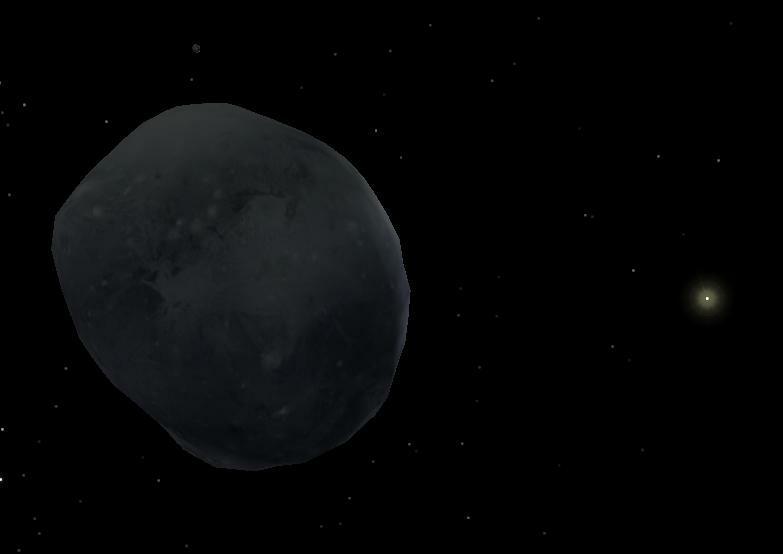 The 2 km long rock will be moving sufficiently fast you can see it move in telescopic view. 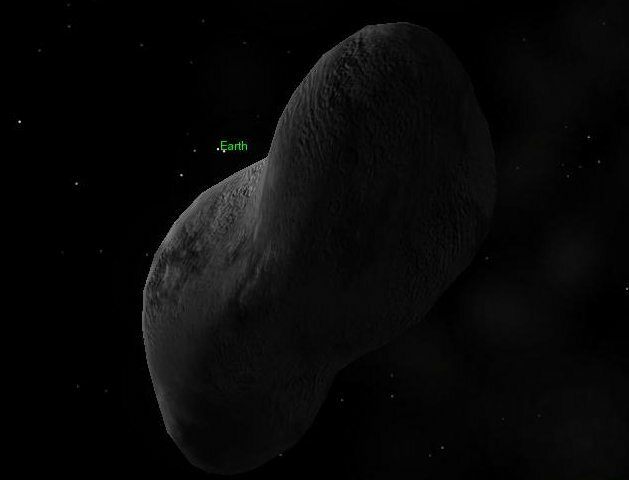 The asteroid will come within 2 million kilometers at closest approach. 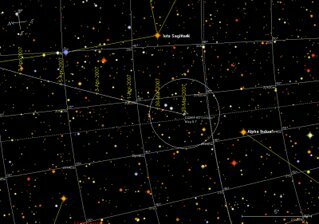 High resoultion map of the asteroids path (click to enlarge), the star labled alpha is Regulus, alpha Leonis. Oribital elements may be downloaded here. There hasn't been much aurora action here on Earth, except for an unexpected aurora in New Zealand. However, there has been a lot of aurora action on Jupiter. Both Jupiter and Saturn have active polar regions, and part of the New Horizons mission is to look at Jupiters magnetosphere. 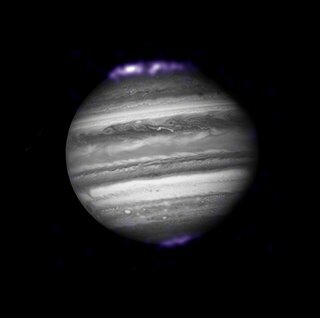 In preparation for the New Horizons flyby of Jupiter, several telescopes, including the X-ray telescope Chandra, were turned on Jupiter. Chandra imaged the aurora in X-rays, and these were combined with the New Horizon imgaes to make the image above (read more details here). There is also a nice animation. For those of you who were enchanted by "Vorstellung der Gestirne", you will definitely enjoy Ian Ridpath's Star Tales. Constellations, mythology and really old Star Atlases. You can't go past it. 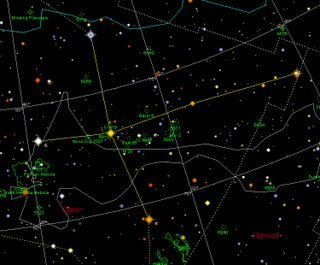 The BA is enthusing over Sky-Map, a web based sky mapping program. But I like this page dedicated to Bode's 1782 Atlas "Vorstellung der Gestirne". Sure it's not up to date (the location of Uranus is way out), but boy it is gorgeous. 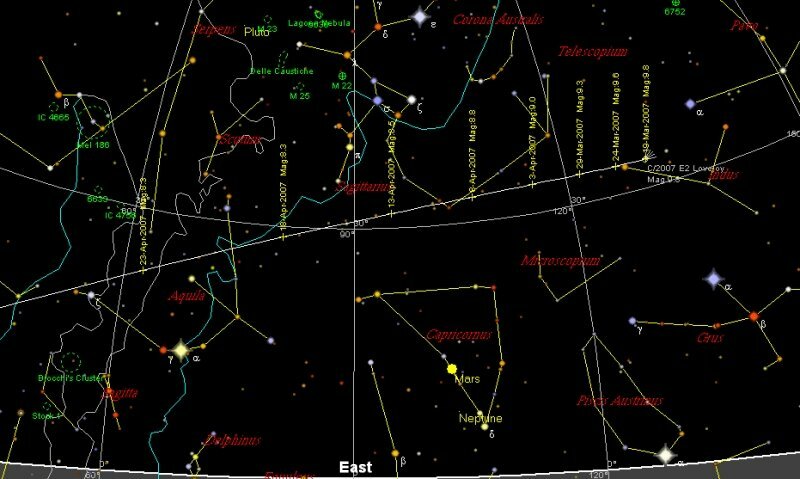 Look at the Southern Plate, with the first of Le Callie's Southern Constellations. 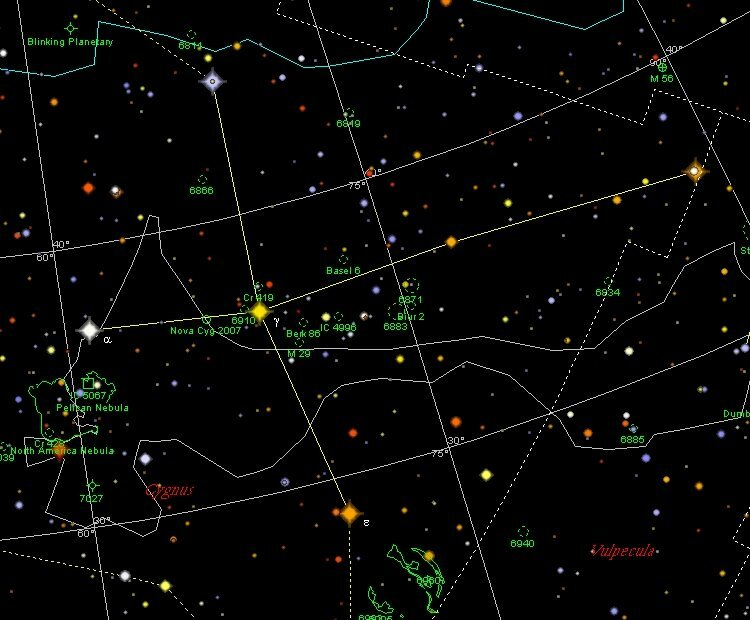 And how about the constellation of the Royal Scepter of Brandenburg? The don't make Atlas's like this anymore. 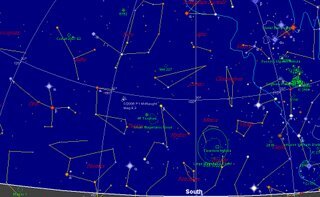 Comet Lovejoy chart, use in conjunction with previous charts. 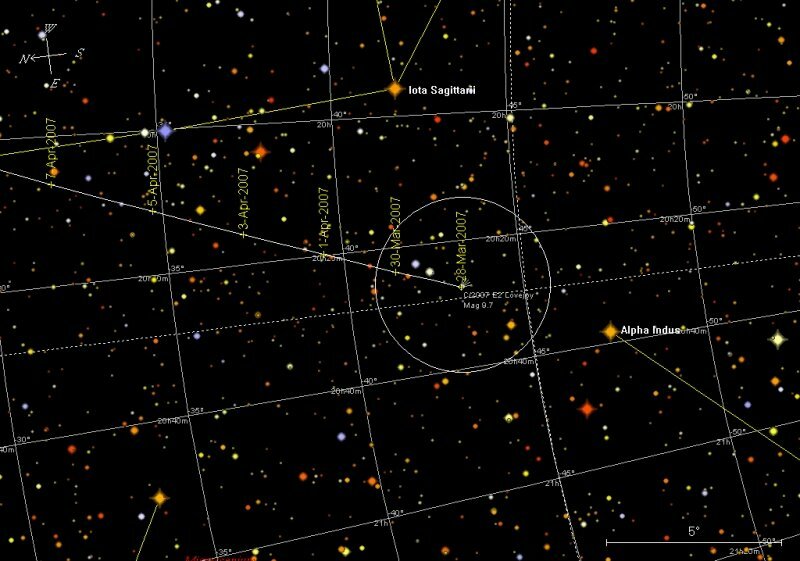 Stars to mag 9 shown, circle is field of view of 10x50 binoculars, click to enlarge. Comet Lovejoy was at perihelion yesterday. The comet is steadily brightening and is around magnitude 8.5. It is potentially seeable using 10x50 binoculars at the moment. I'm off to the Flinders Ranges next weekend, so I'll have a good hunt for it then (currently clouded out but getting much needed rain). The comets closest approach to Earth is in about a months time, with maximum magnitude of between 8-7.5. You can see a predicted light curve and charts here. Rolando Ligustri has posted a nice image here showing a dust tail, in this image the dust tail seems fan shaped, and in Dave Herald's image the tail seems bifurcated. For you added pleasure, there is an orbit simulation up at the JPL NEO site. Okay, so Haiku it's not. 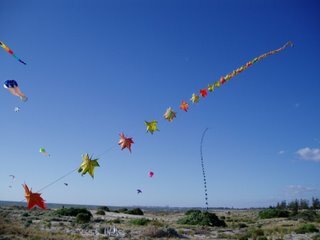 But if you click on the image, you can see the moon just above the Autumn Leaf kite. 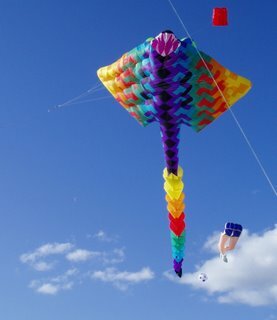 This was taken at the International Kite Festival. The wind was howling, so we expected few kites to be up, but there was a wide range of kites, including some behemoths, a giant multicoloured Manta Ray was very good. We tried flying our kites, but with less than spectacular results. We missed out on the night lantern flight, as the wind was too much for us, but we could see the fireworks from our living room. The competetion to come up with a way to save the Earth from the expanding Sun at the end of its life has had only two entries. 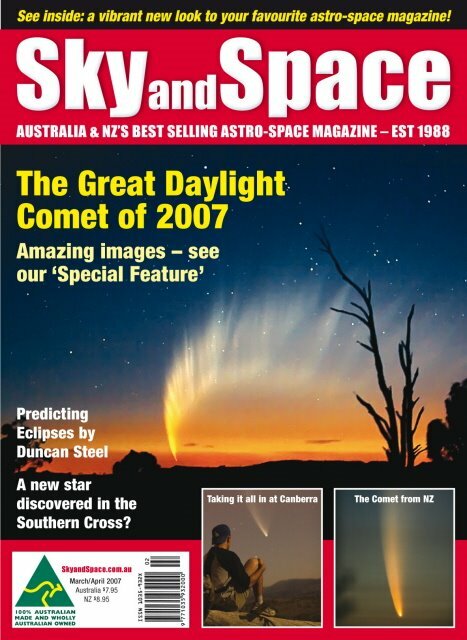 I'll give you all another week to come up with ideas before awarding the prize, a copy of the latest issue of Sky&Space, with great photos of comet McNaught. It's not entirely clear from the graphic on this page, but it seems that the Brain Foundation has reached it's target of $10,000 for Brain Awareness week. Many thanks to everyone who donated. That doesn't mean you can't still donate, every donation will help the Brain foundation in it's excellent work. 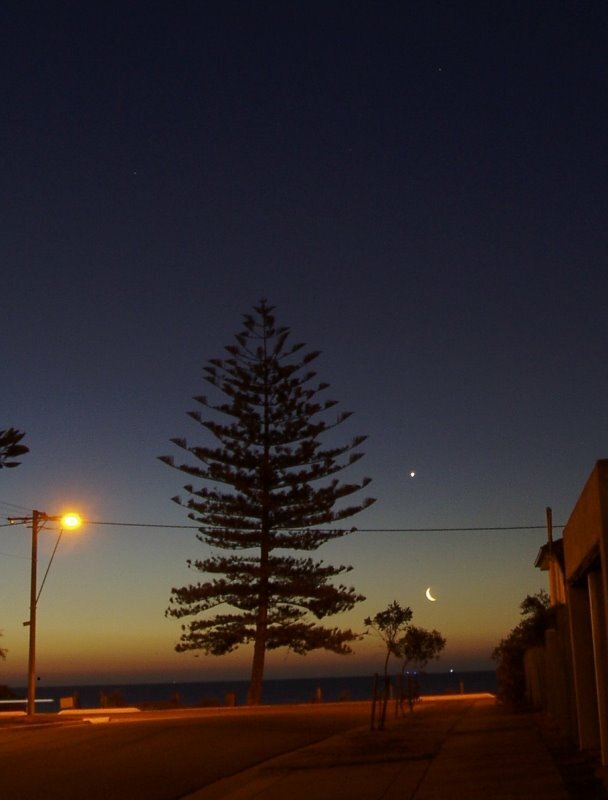 Venus and the crescent Moon above the sea on the evening of March 21st. Click to enlarge the image. I also have an animation of the Moon and Venus (warning 6 Mb file) made from 16 stacked images in the Gimp. You can sorta see the Earthshine. This image of Comet Lovejoy comes from the redoubtable SteveB (click to enlarge). A very nice shot indeed. There are some other nice images of the comet taken remotely in Australia by an Italian group here and here. There are also some images on IceinSpace also keep an eye on the comets forum. Go to this site for a very good photogallery of comet McNaught shots from Chile and Argentina. And the photo gallery of images I was supposed to be making form images readers sent me? Er ahh.. I was stolen by giant time travelling hamsters! Yes that's it! So if you have got some great photos, send them in. Entry forms are here. The winners and honorable mentions form 2006 are here. Here are the charts for 2007/E2 as promised. 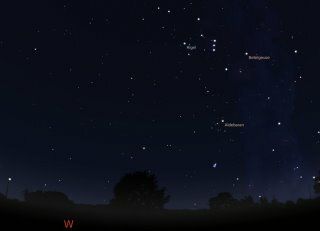 I've put the first orbital solution into Sky Map, and generated the location map (facing east at 5:00 am ACST, similar views will be seen in the southern hemispher at equivalent local times, click to enlarge). Note that these are early elements, and they will be refined with further onservation. Orbital elements may be found at MPEC. The lower chart shows a high resultion view in the same orientation as the horizon map (click to enlarge). The circle represents the field of view of 10x 50 binoculars, stars down to mag 9.5 are shown. The magnitudes are all out of wack, given that the comet is currently Mag 9.5, but for some reason I just cant hand enter the magnitudes correctly. 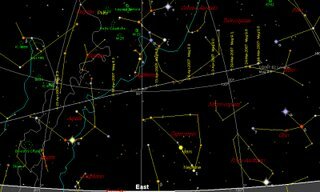 An ephemeris for comet 2007 E2 Lovejoy is available on NEOCP. I'll put a chart up tonight. Don't forget, there is only 3 more nights to enter your observations in to the Globe at Night Survey. There has been a good response from the east coast, but wee need more central/western observers. Calling Alice Springs! (northen Australia has horrible weather, so I don't expect much). Venus and the Moon, half an hour after sunset on Wednesday March 21 (click to enlarge). 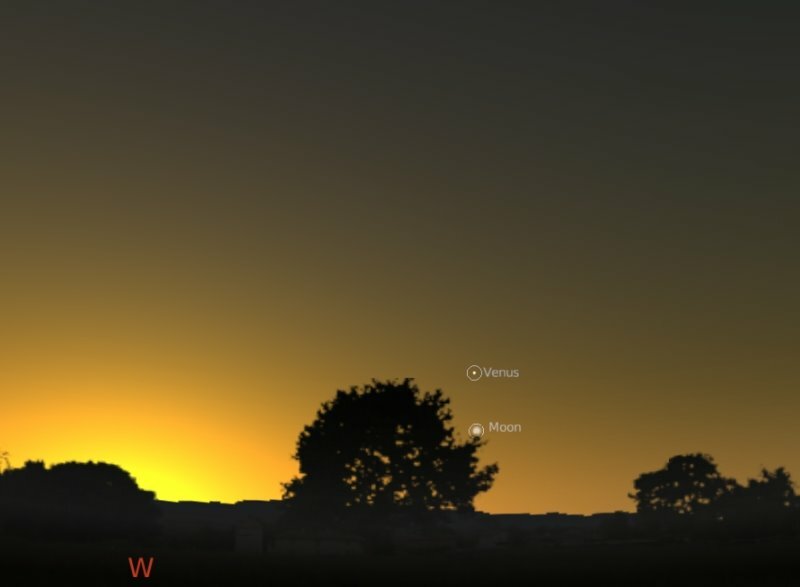 The Moon is just under Venus on Wednesday evening. The best places to see this are places with level westen horizons with no big objects in the way. Then the pair will be easily visible a hour after sunset. On Friday 23rd, the crescent Moon will be very close to tthe Pleiades, a very nice sight. And a Possible NOVA Too. 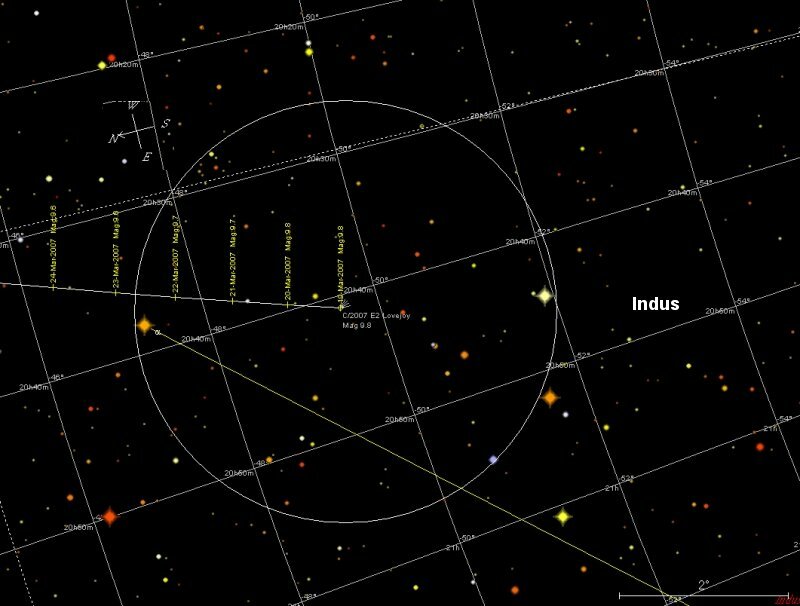 Chart of location of possible nova Cygni, stars down to magnitude 7 shown. Click to enlarge. RA 20h 28 min 12.52 sec dec + 41 deg 48 min 36.5 sec N. AAVSO is currently down, so I don't know if there is follow up on this. 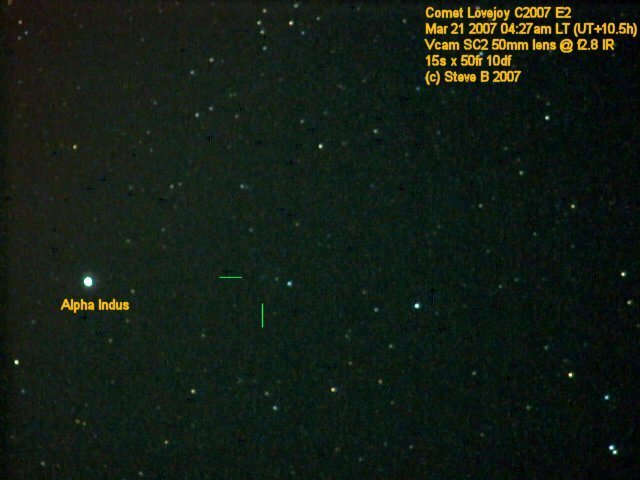 A new comet in Indus - Congratulations Terry Lovejoy! 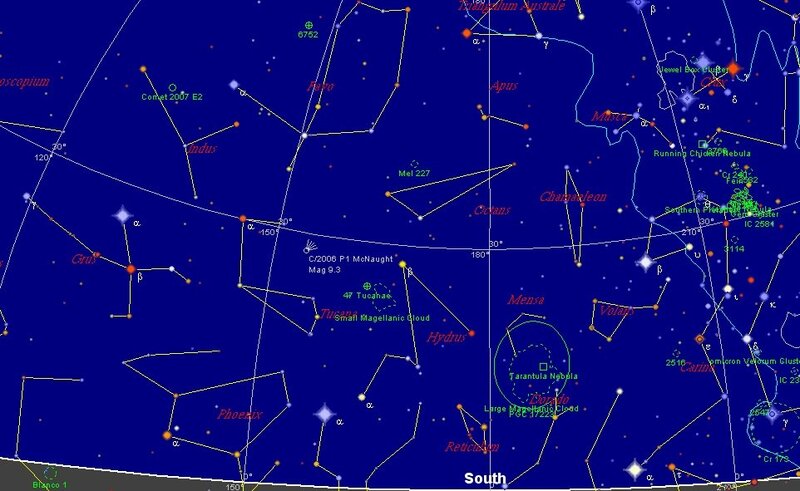 Star chart of the Southern skies at 5:50 am ACST showing Comet Lovejoy. Clock on the image to see a higher resolution image of the chart. In these days of satellites and robot telescopes, it isn't often that an amateur finds a relatively bright comet. But Terry did it! He holds the distinction of being the first amateur to discover a comet using a digital camera (a Canon 350D). Interestingly he was also the first amateur to discover a comet via the internet. This is a fitting reward for the roughly 1000 hours of observing he has put in since 2004. You can see his images of the comet here. John Drummond has independently confirmed Terry's observations, and you can see his image here. Apparently there are some prediscovery images from the SWAN instrument on SOHO, 20070214_0002_SWAN.gif (210,372), 20070215_0002_SWAN.gif (209,370), 20070218_0002_SWAN.gif (206,367) (image identies and locations thanks to Wengto Xu). The comet is currently magnitude 9.5, out of the reach of standard binoculars, but easily within reach of tripod mounted big binoculars and small amateur instruments. We don't have an ephemeris yet, so we don't know if it will brighten or fade. 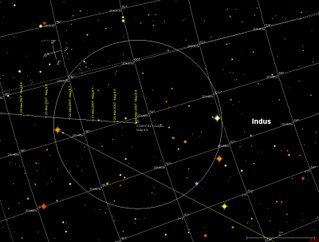 Currently in Indus, the comet is roughly at right ascension 20h 42m 55s, declination -50o 43' 14". You have to get up early to look for it. 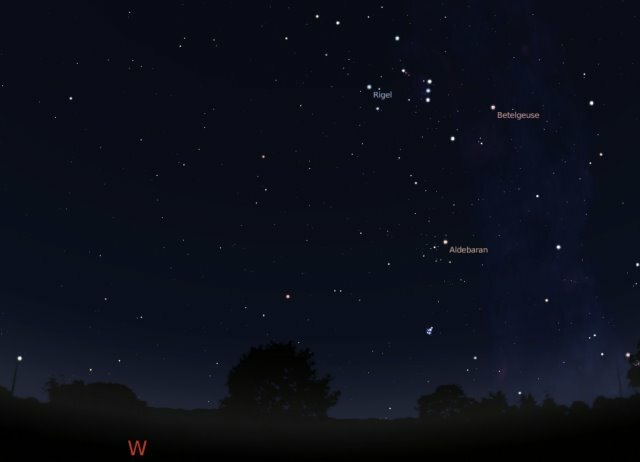 It will be best to look between about 4:00 am and astronomical twilight. 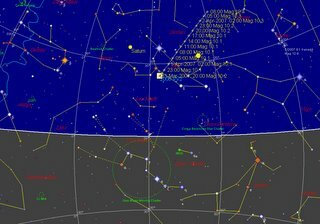 UPDATE: Early resulst suggest that the comet may become binocular bright around mid April. The Australian has yet another anti-global warming article, in the Science and Nature section no less (AHRRGGG!!!). This time pushing the solar connection. Sorry folks, the Sun isn't responsible for our current bout of global warming. I'll do a post on this later, as I'm going to enjoy a (mostly) computer free weekend, but there are public understanding of science issues I want to address. At least there was a letter writer who pointed out that "The Great Global Warming Swindle" was a swindle itself. 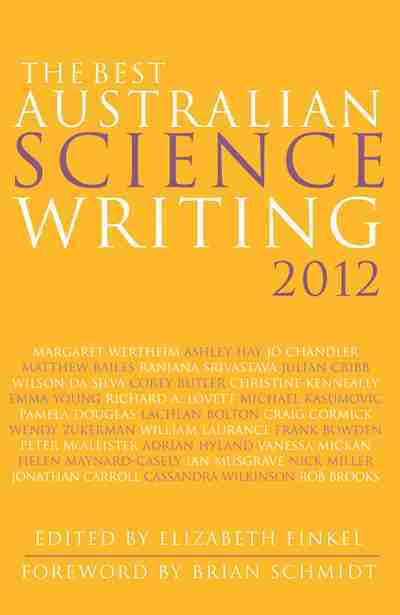 In the meantime, my offer to educate the Australian staff on what science is still stands. The Moon and Mercury reflected in a pool, you will have to click on this image to get a larger version so you can see Mercury. Mercury is above the Moon, near nare the upper palm frond in this reflection. 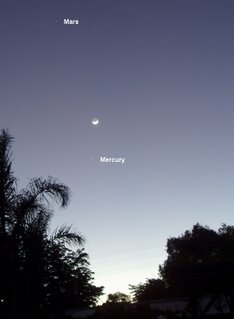 Eldest one was up early this morning, so I tried to show him Mercury, after a while he said "I can't see it, you just have eyes for seeing stars, dad". That cheered me up immensly. A conventional image of the Moon and planets is below. Mars, The Moon and Mercury in the morning. You will have to click on the image to get the larger version so you can see them clearly, but they are just visible on my monitor in the thumbnail. I've been a bit off the ball with the start of semester and all, so I forgot to mention that the March Jodcast is out. There is a fantastic segment on the Drake Equation and the Fermi paradox, which is interesting as I am reading "Rare Earth" at the moment. Don't forget to take the Jodcast Survey. You could win a T-shirt! From the Cosmopoetry project, images of comet McNaught interspersed with Haiku poems. It takes quite a while to load, but it is so worth it. Frank Devine has a little anti-global warming rant in todays (Friday 16th) Australian. The use of "climate change deniers" to describe people who challenge computer- generated predictions of man-made catastrophe is particularly crass. Sorry Frank, you may find it crass, but it's true. Just like HIV-denialists, evolution-denialists and anti-vaccine folk, when people use refuted arguments, irrelevant arguments and made up facts to convince the public that a scientific consensus is wrong, then they are denialists. His comments were particularly ironic, given as this week New Scientist revealed that the IPCC report had been significantly watered down (sorry, you need a subscription to read it all), and things are a lot more worrisome than the report indicates, as positive feedbacks have been underplayed. See also New Scientists special web report on climate change. On the same day Devine's rant was published, the journal Science published articles on the worrying acceleration of melting of the Greenland and West Antarctic ice sheets and the reduction of Arctic Sea Ice (listen to the Science Podcast, which covers this and more). Devine rails against the climate science "monopolists". You don't hear him going on about the Einsteinian relativity monopolists, or the Germ-theory of disease monopolists, or the Heliocentric monopolists. The thing that climate change and germ-theory and heliocentrism have in common is that they are all supported by the data. Let me re-iterate. There is a near overwhelming consensus by scientists on these issues because the data supports it. Frank may not like it, but that's the way science works. You are entitled to your own opinions, but not your own facts. Frank quotes approvingly of an economist. Again with the economists! Would you ask an economist if top quarks were real? Would you ask an economist if EL61 has suffered a serious impact? If HIV caused AIDS? No, so why fawn over economists? Why not ask an actual climate scientist? Perhaps because you will get an answer you will not like. The economist? David Henderson, who authored a badly flawed "response" to the Stern report alongside the usual posse of global-warming deniers. This was the same report Janet Albrecthsen used in her anti-science rant. Do the Australian's correspondents all get their pseudoscience from the same supplier? Devine also resurrects Albrectsen's anti-peer review rant. Sorry folks, that is how good science works, we get people who know what they are talking about to check manuscripts for technical and logical errors, nothing more. This peer- review paranoia is typical of denialist culture (HIV, evolution, vaccines, whatever). This is how science is done, get over it. I am quite will to go over to the Australian's headquarters and give them all a primer on how science works, hopefully it will improve their science reporting. Every week, more high quality research is being published in the best journals in the world by genuine scientists. That research indicates we have a lot more to worry about that even the IPCC report suggested. Economists, it may give you apoplexy to think that the world does not behave according to your wishes, but the reality of human-caused climate change was determined in the same way we pharmacologists designed the drugs that you are now popping to contain your blood pressure. Again, it's science, get over it. UPDATE: I missed the editorials praising the very bad "documentary" The Great Climate Swindle. Deltoid and Nexus 6 have responded. The Australian does seem to have a love affair with pseudoscience. There is a reason I study Alzhiemer's disease, I completely forgot it was International Brain Awareness Week. A public awareness raising event, it's purpose it to get people in contact with their brains. Unfortunately, it ends this Sunday, and most of the Australian events are over. However, there is still one thing you can contribute too. The Brain Foundation sponsored a Pony Tail-ectomy. Professor Bob Hill, Executive Dean of the Faculty of Sciences (scroll down for pictures) had his ponytail of 30 years cut off today in order to raise money for the Brain Foundation (and I forgot my camera). The event had a special meaning for me, as one of my former undergraduates performed the Ponytail-ectomy. He was a recipient of a Brain Foundation scholarship, and is now working as a rehabilitation facilitator. The Brain Foundation are currently $2,200 off their target, so why not donate to them and help them make their target and keep up their good work. (disclaimer, the Brain Foundation also generously supports my research, and are looking at me as the cropee if they hold the event next year). EL61 is a Kupier Belt Object and the third largest "dwarf planet", it is also very bright, almost pure white, very heavy for a distant object which should be largely water ice (mean density of basalt), cigar shaped, spinning rapidly and accompanied by two Moons. This adds up to a puzzle, and the favoured explanation was that these unusal features were due to an impact smashing off most of EB61's mantle. Now Mike Brown and his team have published in Nature a report on finding 5 smaller objects in much the same orbit, which is consistent with the impact hypothesis. You can read further comment on this discovery at New Scientist and ScienceNow. Apparently it is Pi Day, courtesy of Tom. The Bad Astronomer also weighs in, as does Retrospectacle. The latest flyby of Titan by Cassini has found seas on Titan. Well, big lakes really, but really big lakes. Lakes are nothing new on Titan. But some of these are the size of the largest lakes on Earth, and one is bigger than the Aral Sea. Given that Titan is about the size of Mercury (about 2.5 times smaller than Earth), I suppose we can consider bodies of liquid larger than the Aral sea seas. Providing they are bodies of liquid of course. Basically these are flat, smooth radar reflective areas. Normally that would mean liquid, but Titan is an alien world. If it is liquid, it will likely be a mixture of ethane and methane, not the best thing for a quick dip. There is also an animation that can be obtained at this page, but even the small one is 50 Mb!!! Hey that was quick! The Wikipedia entry on Titan already has the lake images up! 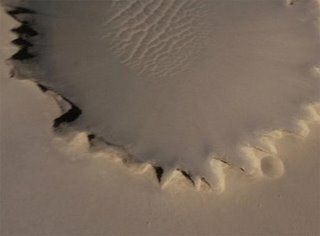 New 3-D flyovers of Mars have been released. Using high resloution images from the Mars Reconassiance Orbiter, NASA have created detailed flyovers of the sites where the rovers SPIRIT and OPPORTUNITY are working. The Flyby of Victoria Crater (2.4 Mb) zoooms by a virtual rover then skims aross the dune filled crater. The Flyby of the Columbia Hills (4.5 Mb) appraches across cratered plains then pans up the rugged hills themselves. 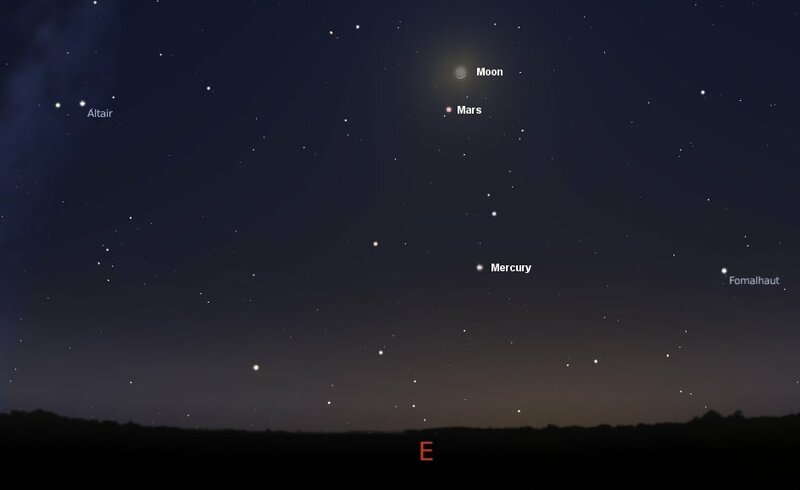 If you are up about an hour before sunrise, as I am quite often, you will see something rather nice on the mornings of Friday 16 March and Saturday 17 March. 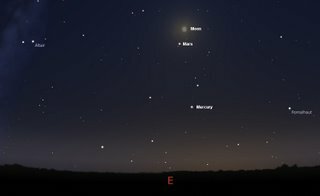 On Friday morning, the Crescent Moon will be just above Mars (see diagram to left, click to enlarge), and on the 17th it will be just above Mercury. A very fine sight indeed. 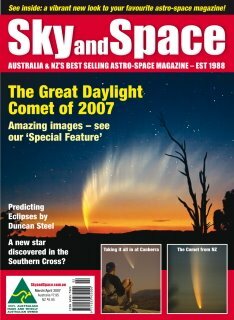 Sky and Space Magazine for March/April is out now (the website hasn't been updated yet, but it is out). There are some fantastic images of comet McNaught (and stories to match), and a short article on the two novae in Scorpius by yours truely (as well as my usualy planetary section and star hopping). If you don't have the disposable cash for this issue, most local libraries will have a copy, so you don't have to miss out on this great issue. .. you're in for a big surprise. 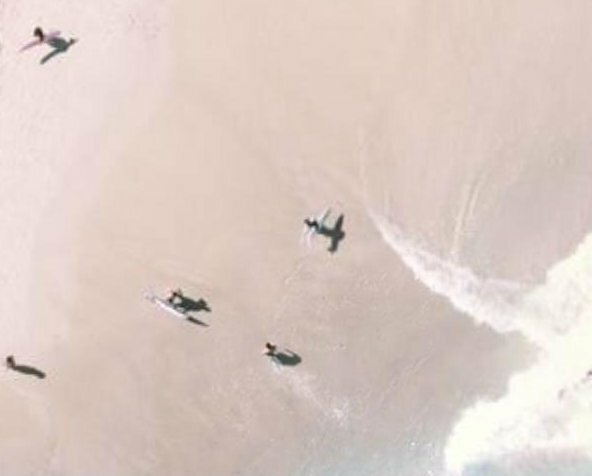 This is a clip from the new hi-res satellite images of Bondi Beach, Sydney on Google Earth. The level of detail is, well, stunning. The maps over Adelaide are updated, and are way better than before, but not to this level of detail. So, if you are going to Bondi, better keep your cozzi on. 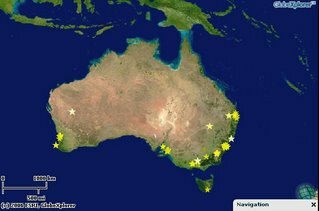 NightSky Survey, more Southern Hemisphere observations needed. This is the current map of Australian submitted observations to the GlobeAtNight Project. 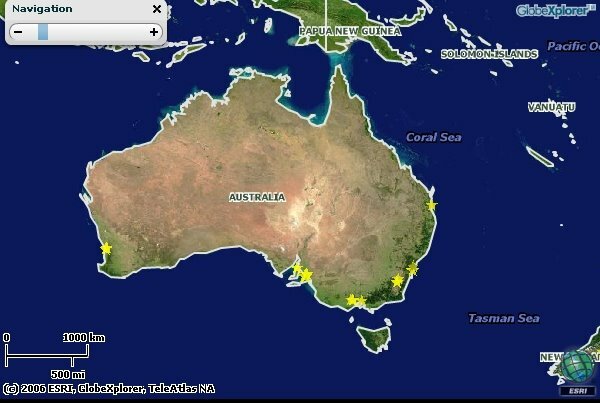 Not many at the moment, we can do better (where the heck are the Tasmanina observations?). Far Northwestern Australia is being battered by cyclones at the moment, with terrible damage (were thinking of you folks), so I donb't expect anything from there, but further south, all you have to do is go out and check up on Orion. Give it a go, it will be fun! And the rest of the Southern Hemishper eis lagging as well, go get observing folks! Pop over to the McNaught photogallery of the Royal Astronomical Society of NewZealand. You'll be glad you did! (But it will take some time to load). PZ Myers, developmental biologist, unbeliever and squid enthusiast, is 56.17 Apophis orbits old. In terms of count down to Aphophageddon years, PZ is a sprightly 32.38. PZ's award winning blog is Pharyngula, why not drop over and wish him a happy birthday. PZ, you may be interested in this article in Nature, "Scriptural violence can foster aggression" (subscription only, sorry). 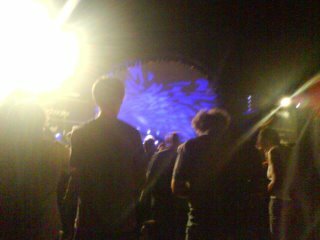 The Bettdeckererschnappender weisle and I are off at WOMADelaide for the netx few days. Last night we listened to some amazing Central Asian throat singers. Looking forward to more delights for the rest of the weekend. So you will have to read up on groundwater on Mars and solar powered asteroids by yourselves. Western horizon as seen from the Southern Hemisphere an hour and a half after sunset. Click to enlarge. Orion is top right, marked by Rigel and Betelguese. How many stars can you see? It depends on whether you are living in the bush, the suburbs of the heart of town. Light pollution is so bad in some places, you can only see the brightest stars. There is a world wide survey of star visibility going at the moment, Globe at Night. DaveP has the details, but basically, between now and March 21, go outside at around an hour and a half after sunset, possibly a bit later, let your eyes adjust for a few minutes (or more, after looking at the computer screen it can take up to 5 minutes for my eyes to adjust), compare what you see of the constellation Orion (see map above, or print out the maps in the Family Activity pack) to their starcharts, and submit your observations. If you are using a torch to read the Family Activity Pack maps, remember to put some red cellophane over the end so as to not destroy your night vision. Simple as that, and you are contributing to our understanding of light pollution as well a doing a bit of amateur science. Even thought I didn't see last weekends eclipse (althought it was a rare eclipse visible on all continents, you had to be in the westernmost Western Australia to see a faint darkening of the Moon), I got to share via other peoples accounts and images. Will Gater mashed a pair of binoculars, but got some fantastic images of the Moon, (hat tip to Stuart, who watched the eclipse from Rome, lucky lad). 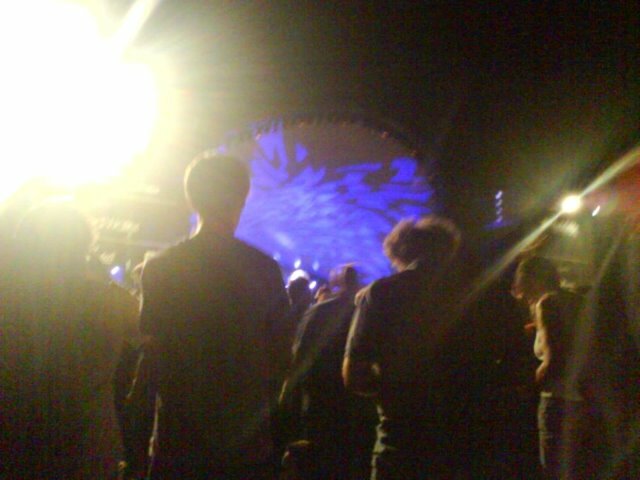 DaveP has a nice shot and a good account (he destroyed his glasses, seems to be an accident prone eclipse), Top of the Lawn has a very good and atmospheric account of the eclipse from New York and Tom even managed to see it fleetingly between the clouds. Here is a gallery of images from ABC news, APOD has the lunar eclipse from STEREO, which the Bad Astronomer mentioned before. I haven't seen any reports from Africa or India yet. UPDATE: Nice image of the eclipse at Lunar Post of the Day, they also have a stunning image of Saturn grazing the Moon, Hat tip to the Bad Astronomer again. There is a nice podcast on Science Friday about asteroids that includes a discussion of potential Earth Impactors. 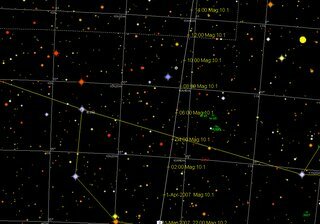 Apophis (the asteroid, not the character from Stargate) will make a near pass to Earth in 2029. So what you say? Well, if it passes through a certain region of space, the so-called key-hole, during this approach it could be deflected onto an orbit that will lead to a "high" (one in a thousand) probability of Earth impact in 2036. If you are still around in 2036, ths could ruin your whole day. Of course if we knew Apophis's orbit in more detail, we could get a better idea of whether it will go through the Keyhole, and give us more time to prepare. The Planetary Society is running a competition to design a mission to "Tag" Apophis with some sort of marker or transponder so that we can measure its orbit more precisely and allow a deflection mission to be started in 2017. The conditions of entry are here. There is a $50,ooo US prize, and who knows, you just might get to save the world! So How Do Newspapers Treat Science Stories? I've been banging on about how the Australian got an Economist to balance a story about the release of an anti-global warming book. But it seems most science gets this treatment. Here's Ben Goldacre talking about reporting on GM foods. The key quote"
Yeah, why ask scientists, or science journalists, to cover science stories, it's not like they are important. Run, don't walk, to the Bad Astronomers post on the Moon as seen from STEREO. Seeing as I'm digging up old spcecraft stories, let's do a Rosetta roundup. 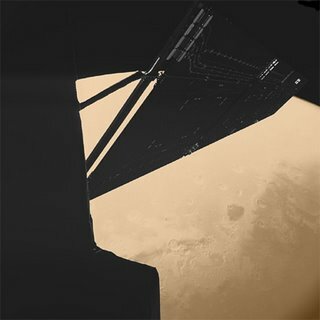 This amazing image was taken by the Rosetta Lander Imaging System (CIVA) on board Rosetta’s Philae lander as Rosetta swung around Mars. Also from Rosetta are an animation of Phobos crossing in front of Mars, a 3D image of Mars (the b&w version works better for me than the colur vestion) . The images form the OSIRIS camera are pretty spectacular, with some good cloud shots. And Rosetta and New Horizons are teaming up to image Jupiter in tandem, this could be interesting. 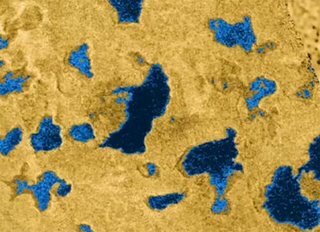 Although the Hyugens lander splatted into what appeared to be a soggy delta rather than a lake, Cassini has been rounding up evidence for lakes of liquid methane on Titan (rather than seas as people first thought possible). 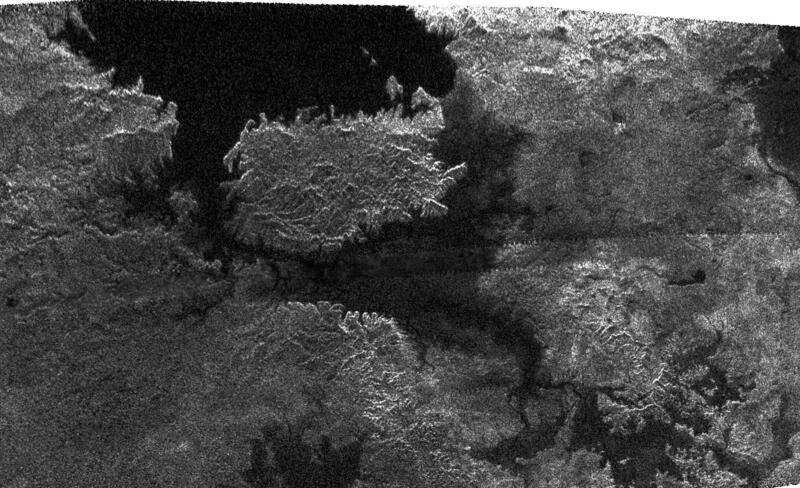 The latest images from Cassini's polar flyby of Titan include this splendid one, of a large lake with an island in it. A high resolution version of this image (404 Kb) is here. You can also get a Titan Virtual Tour. On March 3-4, there will be a total Lunar eclipe that will be completely visible from Africa, and partly visible from India, parts of South America, and some parts of South East Asia. A map with locations and times (in Universal Time) of times of contact may be found here on the Sun-Earth site. In South Africa, the eclipse will be at maximum at around 1:20 am on the 4th, local time. 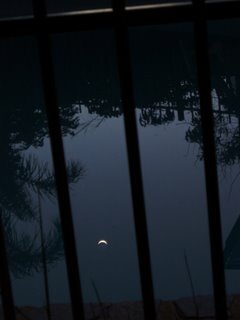 In India, Maximum eclipse is at 4:50 am on the 4th in New Delhi. In Singapore, the Moon enters the umbra at 4:50 am, and totality is at 6:13 am, March 4th civil twilight occurs shortly after. In Rio, the eclipse is at maximum at 8:20 pm on the 3rd. Sunspots and Global Warming - Oh My! The global warming debate, at least as it is being played out in the newspapers, is a familiar one to those of us who have been involved with creationism, anti-vaccination activists and HIV-AIDS deniers. But unlike past encounters, the global warming deniers have full run of the newspapers, with scientists very rarely seen. The latest installment is the launch of Ray Evans book "Nine Facts About Climate Change". 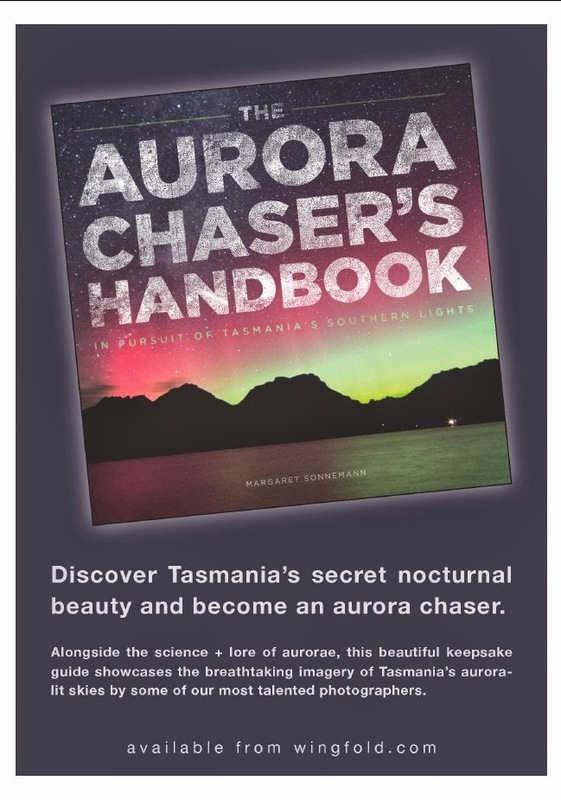 It expands on a pamphlet of the same title released in November 2006. The release was attended by many notables, a fair percentage from the mining industry. Sadly, Liberal MP Dennis Jensen organised the launch on behalf of the Lavoisier group, a global warming denial group set up by by Ray Evans and former mining executive Hugh Morgan. It's unfortunate to see someone sensible caught up in this. The launch was covered by the Australian and the Age. The Australian also reported part of Former mining executive Arvi Parbo's talk at the launch. What was notable was the absence of any interview or balancing remark for any scientist, let alone climate scientists. The Age's report dryly notes that Mr. Evans's claims are not supported by "scientific bodies including the World Meteorological Organization, NASA, the CSIRO and the Bureau of Meteorology". The Australians report is balanced by an economist talking about the bleak future for coal. An economist! Why were no climate scientists interviewed? Arvi Parbo said in his speech "I was brought up to believe that scientists not only welcome but encourage questioning of their conclusions." Yes, we do, but when you get the same, debunked questions over and over again we do get a little testy. Having to explain for the nth time that some supposed flaw has been addressed in detail, repeatedly, gets on your nerves after a while. One gets sick of explaining that the HIV virus really does exist, or that there is no connection between MMR vaccine and autism. So it goes for global climate change. The "questions" the "sceptics" ask have been settled a while ago, they just ignore the answers. Well, what about the book? I haven't read it, but as the book is based on the pamphlet, I am not very sanguine about it. The pamphlet covers the usual denialist territory, and is extensively referenced to well known scientific publications like the Wall Street Journal, and climate expert Christopher Monckton, (that's sarcasm folks). True, it does cite some real scientific papers, but often they are misinterpreted or irrelevant (and pretty much out of date). One issue that illustrates the misinformation best, is a claim the Evans promotes in the pamphlet, and in his launch speech. This the idea that we are going into a cooling cycle. I will assume this cooling claim is in the book as well, in much the same form as the pamphlet, based on how it is mentioned in the speech. and Prediction for Activity Cycles 23 and 24", Solar Physics, 199, 421-435 is actually from "Solar Cycles 24 and andand Predicted Climate Response", David C. Archibald, Summa Development Limited, Perth, WA, Australia. This could be a minor typographical error, but the citation of the graph as work of Badalyan et al gives it authority the graph actually lacks (it's from a non-peer reviewed source, unlike Badalyan et al). The graph is interesting (and here we get to the astronomy content) as it allegedly shows predicted sunspot numbers for solar cycles 24 and 25. As an avid sunspot follower, this graph immediately struck me as odd. I'll come back to this. Evans claims is that in the next decades the world will actually cool, because the next two sunspot cycles will be weak. Now we know that one of the things that drives climate is how much energy the Sun puts out, this is to some degree related to sunspot number. The Maunder minimum, when the Sun was near devoid of sunspots, coincided with the "little ice age". However, the role of less severe fluctuations in sunspot number is not so clear cut. Certainly, climate scientists have spent a good deal of time looking at solar energy variation and its role in the current bout of climate change. The conclusion is that there is little evidence for the sun being responsible for the warming since the 1950's (see also here for further discussion). The latest IPCC summary, based on the latest data, shows a very minimal contribution of solar forcing. Be that as it may, what about Evans's claims that the Earth will cool in the next few decades. This is based on predictions of the height of sunspot cycles 24 and 25. For cycle 24, the value given by Evans is the lowest of a number of predictions from a variety of predictions (the average prediction is much higher than the one used) , whereas the prediction for cycle 25 appears to be pulled out of a hat. Sadly for Mr. Evans's prediction, science marches on. The latest predictions, based on far more solid data, is that solar cycle 24 will be bigger than solar cycle 23. 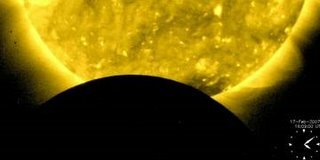 Solar cycle 25 is likely to be smaller than solar cycle 24, but again the modern predictions are for a higher cycle than the values used by Evans. The bottom line is that contra Evans, the Earth is not about to go into a cooling cycle anytime soon. This data was publicly and easily available last year, but from Mr. Evan's speech, it looks like he hasn't found it in the process of revising his book from the pamphlet. Then again, given that the few scientific references that he makes in the pamphlet are mostly from 6-12 years ago, I'm not sure that the book will be up on the latest climate science (this is common with HIV-AIDS denialists, creationists, and anti-vaccination people, they seem to only present the oldest science for their puposes). In conclusion, even on one easy to check issue, Evans is wrong. This is the only item from the pamphelet that I am sure has made it into the book. However, it appears to be one of Evans major talking points. If something as central and simple as this hasn't been checked, then if the rest of the material in the pamphlet makes it in, the book will be a sorry mix of misinformation and misinterpretation. Yesterday Janet Albrecthsen got into the anti-science/anti-global warming act trying to trash the Stern review. It was a bit ironic that everyone suddenly sat up and took notice when an economist talked about global warming, but that is not my point today. In most of her article, Albrecthsen references "The Stern Review: A Dual Critique" which has some of the usual denialists as authors and is riddled with errors. But I'm not going to talk about that either, the critique has been sufficently debunked. "The so-called consensus on global warming is a manufactured one built by those whose careers depend on acceptance of climate change fundamentalism." Aside from the fact that the consensus was built in the same way that our consensus on relativity, or HIV as the cause of AIDS was built (by scientists doing research, publishing it, getting the research critqued, doing more research, replicating findings etc), the "careers depend" canard is straight from the playbooks of HIV denialists and creationists (old style and ID). As if there were not enough research questions around for scientists to study friutfully if HIV didn't exist, or if the climate was not changing rapidly. Reconstructing paleoclimate, and understanding climate drivers, would still be important and support careers even if the climate wasn't changing. But it is a common denialist diversionary tactic. "And the peer review process means drawing peers form the same global warming orthodoxy milleu as the authors"
This is a bit of a jaw dropping statement, and either displays a lack of understanding of science, or science envy. Then again, this is a standard HIV denialist and creationist canard. They like to protray peer-review as a closed club where only like minded thinkres get a look in. It's not true of course. Peer review does have its weaknesses and limitations, but it is our way of ensuring quality control. Papers are reviewed to ensure that the right methods have been used, and data is not misinterpreted or over interpreted, not that it adheres to a party line. The other day I reviewed a paper that had conclusions favorable to my own hypothesis, but the paper had omiteed a key piece of evidence. I recomened the paper not be published without that piece of evidence, no matter that the paper supported my ideas. It is interesting that several HIV denialists are also ID creationists. Denialism seems to run in bunches. It would be interesting to see how many creationists are also global warming denialists. Mark Steyn, a global warming denialist, is also a creationist (or at least terminally clueless about biology). What about Janet Albrecthsen? Is she a creationist or HIV denialist too? She certainly has copied their rhetoric wholesale.